From convergent lenses and diffuse lenses to best form lenses and aspheres, our extensive selection of simple lenses, or singlets, with various focal lengths and diameters guarantees that you can find the components you need for your application. LINOS has over 130 years of experience in the production of precision optical components. Only high-end materials from established manufacturers are used in production, with the narrowest possible production tolerances to ensure the best quality. 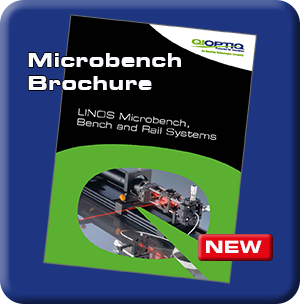 Furthermore, the versatile mount system makes LINOS singlets compatible with bench systems both from LINOS and from other manufacturers. And, of course, a broad range of economically priced standard anti-reflective coatings is available as well. All data (radii, center thicknesses, materials) and designs can also be found in our WinLens optics software package. Broadband anti-reflective coatings and customer-specific coatings are also available. Laboratory setups; industrial metrology; laser technology.